This ground-breaking new book presents an action plan for moving the distribution center from the typical fire-fighting mode to best-in-class performance. (Boonton, NJ, January 24, 2011)  For decades managers have been improving distribution centers in a piece-meal and haphazard way. This type of progress is difficult and slow. Many initiatives involved either IT or supply chain integration, which have typically produced only minor improvements. While the initiatives may have been excellent, the problem is that they were introduced when the organization was not yet ready for them. If initiatives are introduced at the right time and in the correct order, they will be significantly more successful. So what is the proper implementation strategy for improving the distribution center? 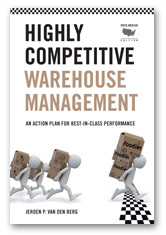 In Highly Competitive Warehouse Management, author Jeroen P. van den Berg introduces a new approach to warehouse improvement. He defines four distinct stages of warehouse maturity and a process for building on past successes to move to the next level. Advancing from one stage to the next, the manager can realize up to a 10 percent savings in operating costs at each level. Reactive Warehouse Management. The first stage of maturity, reactive warehouse management, serves as the baseline. Here, the distribution center processes are unstructured and ill defined. Performance is unreliable. The manager constantly needs to react to the same events on a daily or even hourly basis. Individual heroics and "working around the system" are what make things happen in this type of distribution center. Effective Warehouse Management. In the next stage, management of the distribution center is standardized. These efforts not only simplify day-to-day management, they also facilitate a transparent analysis of the bottlenecks. The distribution center becomes an effective link in the supply chain. Responsive Warehouse Management. In this stage information technology is used to increase performance. IT is a powerful enabler of logistical improvements. However, existing logistics models hardly address the use of intelligent information systems. At this stage, planning and control principles that respond in real-time to events are critical. Collaborative Warehouse Management. In this final stage the role of the distribution center within the supply chain is considered. The perspective is broader than the four walls of the distribution center. In other words, the previous stages sought to do things right in the distribution center, without considering if the right things were being done for the entire supply chain. In this stage, performance of the entire supply chain is improved through better collaboration with the distribution center. Is it a strict rule to obey the sequence of the maturity stages? In principle yes, but exceptions are possible. If a quick-win is observed in supply chain collaboration, i.e., a stage 4 optimization, while the distribution center is still muddling in stage 1, then the manager should not hesitate to implement it. "Go ahead and pick the low hanging fruit!" says van den Berg. "However, remember that the operation should be ready for it and realize that the project would be easier and more successful after mastering stage 3." To learn more about Highly Competitive Warehouse Management read the white paper, Growth Path for Warehouse Optimization at http://www.DistributionGroup.com/highly_competitive_warehouse_management.php. Dr. Jeroen P. van den Berg is a well-known expert in warehouse management. In his work as a consultant, author, teacher, speaker and researcher, he challenges people to see the big picture and overcome the obstacles that prevent progress. He has a unique talent for giving structure to complex issues so that they become easy to understand.